1. 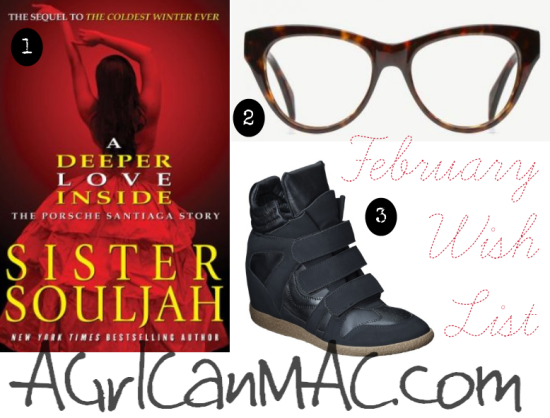 A Deeper Love Inside: The Porsche Santiaga Story - This is the sequel to The Coldest Winter Ever and it picks up where TCWE left off. It shifts to Porsche's, Winter's little sister, perspective in this one. TCWE is one of my favorite books to date so I can't wait to read this. 3. High Top Sneaker Wedges- I'm finally ready to get a pair. This pair from Target are pretty cute. Is it bad that I don't want to pay $35 for a pair of sneakers from Target though? $35 isn't a lot of money....but it's Target.... Lol. Have you read the Midnite series. I can see the growth in her writing. I'm so excited to read about Porsche. Hi Kissa: Yes I read those series. Can't wait to read about Porsche too! I just purchased the same sneaker from target for buy one get the second 50% off.